Easy Breezy, Bright, & Bold. Pink Chicken offers classic little girl wear for all season & personalities. Their current Fall line reminds me of a Moroccan Spice Market - rich reds and fuchsia, ethnic prints, deep purples, gold paisley. Feels warm & festive. We got to try the Reese dress. It is amazing. 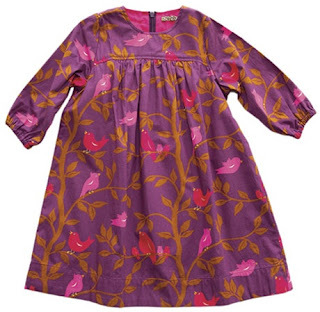 High quality fabric & workmanship paired with the sweet birds print and little pink sparkly button on the back - it's perfect. 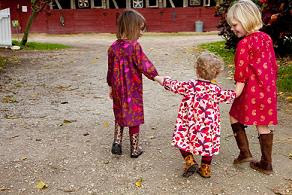 Pink Chicken designs clothing that is easy, breezy dressing that is no fuss and always stylish. One very lucky winner will receive a dress from Pink Chicken. Winner will choose size, Pink Chicken will choose design - based on availability. *Follow me @jamaise at Twitter & Tweet this : RT @jamaise #GIVEAWAY #WIN -A dress from the sweet boutique - Pink Chicken #holidaygiftguide http://bit.ly/cMNqmt Ends 11/28 tweet each day for one entry each ! I love the belle dress, this style is so beautiful. I also follow via GFC. I love the Belle dress! So sweet! I entered your George Foreman Smart Kitchen Multicooker giveaway! I adore the Jade dress. I love those colors together. All of their dresses are just gorgeous! My Favorite item is the Audrey and Gwen Dress! I entered the sahale giveaway! I love the Gwen and the Ginger. I entered the Kaspersky giveaway! My favorite item is the graphic tee with the mushroom on it. I follow through Google Friend Connect. 1. current gfc follower as "sswpss"
2. current gfc follower as "sswpss"
3. current gfc follower as "sswpss"
I love the Jade Dress & I follow. I would choose either the Julia dress or the estelle dress....beautiful. I love the Reese Dress in a 4 T. Such cute dresses! I am a friend of Wishing Penny! i love the belle dress in the botanical garden design. GFC blog follower and I love the kelley dress. I love the STriped Ginger dress!